Toronto (ON), Canada - 21 January 2008: SWP, Inc. has announced that its both UFDC-1 and UFDC-1M-16 sensors interfacing circuits are also available now in 32-lead, Thin (1.0 mm) Plastic Quad Flat Package (TQFP). 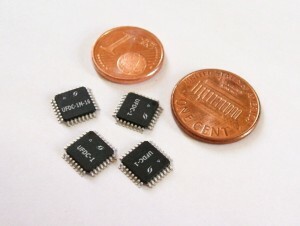 Both CMOS ICs - two-cannel Universal Frequency-to-Digital Converters can work practically with any sensors form frequency-time signal domain and convert frequency, period, its ratio and difference, duty-cycle, duty-off factor, PWM signal, time interval, pulse width and space, rotation speed, pulse number, phase shift - to - digital. The UFDC-1 and UFDC-1M-16 have high and constant selectable accuracy (programmable from 1 to 0.001 %) in a wide frequency range up to 7.5 MHz (120 MHz), scalable resolution and non-redundant conversion time. Both ICs can work in 16 measuring and one generating modes and have 3 popular serial interfaces: RS-232 (including a master communication mode), I2C and SPI. For more details about ICs UFDC-1 and UFDC-1M-16 please visit the following <products web page>.